Most pests avoid light and prefer the undersides of leaves or dark crevices down inside the plant. Not aphids. These bold little creatures work right out in the open on the plant's flower buds, and even on open flowers. Usually less than an 1/8th inch long, aphids are easy to spot. 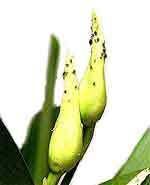 Typically black, they feed by piercing the plant and sucking out the moisture leaving behind stunted flower growth. A single adult female can reproduce without a mate and typically gives birth to 60-100 young every day for a period of 20 to 30 days. 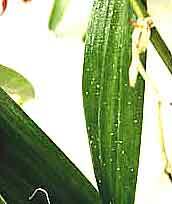 A second type of Aphid forms on the plant's leaves. The first sign of trouble is a shiny "honeydew" substance. Look closely and if you see tiny white specks, your plant has aphids. The sticky coating they leave behind makes it hard for the plant to breathe and attracts ants. Aphids prefer new growth making them easier to see than most insects. Neem Oil is an effective control for ahpids. Mix 1 TBLS of Neem Oil in 1 quart of water in sprayer. Add a drop of dish soap to help the Neem Oil mix with water. Shake thoroughly. Supporting plant with one hand, gently dislodge the aphids with your thumb and forefinger.